Eisel’s advice to players of the spitzharfe or arpanetta addresses an issue for players of musical instruments which are played by the fingernails – how do you manage if a nail is injured and cannot be used? 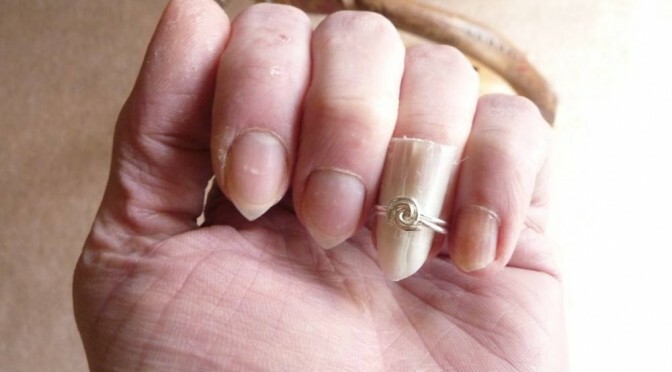 Nowadays it is normal to glue a false nail made typically of plastic, to extend a too-short or damaged natural nail. 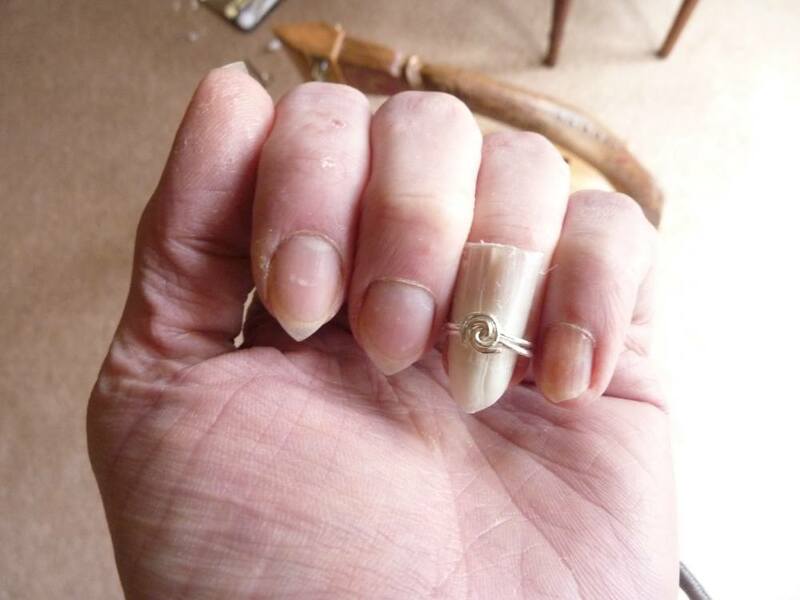 However I have an injury to the ring finger nail of my left hand, so that this is not possible – the natural nail is too weak to support an extension. others have a feather quill, softened in water and flattened, cut into the form of a nail, and they attach one of these to each index finger with a silver ring. I cut a section from one of my mother’s goose quills. At first I used part of the straight shaft, but actually the pointed end works better, as the quill curves down like a natural nail does. I did not soak the quill in water before flattening – I will try that next time. Mine cracked or creased a little. And I made a little silver ring, out of spare silver harp string wire. I have not finished working at this – it is less comfortable to wear than it should be; either it is comfortable but the quill shifts and clicks as you play; or the ring is too tight. I wonder if a wider band may work better. However I am delighted to have a hand-made natural alternative to superglue and ping-pong balls, or the clip-on plastic picks.